This unique grandeur project was to reproduce the allure of New Orleans Style, beautifully incorporating floral vines woven throughout the iron screen. .. This photo is showing more detail of the prior project SP-001 . .. This beautiful screen incorporated vines and leaves in their natural form. Framed to offer a breezy barrier while enjoying the patio and watching the birds come up close to enjoy the feeder in the center frame. 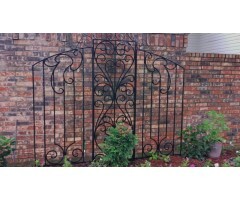 ..
Landscape decor or use as a privacy screen as a trellis for vines or roses ..